Origin: HYDRA is an underground subversive organization created and led by Baron Wolfgang von Strucker. It was when Hitler called for von Strucker’s arrest for his numerous failings, the Red Skull promised him a safe passage out of Germany to Japan if he would begin organizing a new army that would rise up after the current global conflict was over. It was agreed that von Strucker would start up the organization and then the Red Skull would resume command once he was ready too. 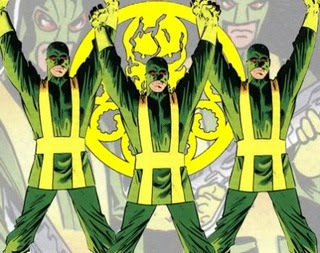 While in Japan, von Strucker took over the Hand Organization and used its members as HYDRA’s founding fighting corps. HYDRA then struck both Allied and Axis interests until a joint US/Japanese commando force was successful in destroying HYDRA’s base of operations and most of its personnel. Strucker however escaped and returned to Germany where he found favor with Hitler once again and was reinstated. It was with his new command that he covertly recruited and equipped an elite force of battle-hardened veterans from various Axis units to create the second resurrection of HYDRA. Promising protection and wealth after the war, von Strucker was able to convince many to join his covert army. HYDRA has developed an extensive underground communications and supply network within war-torn Europe and has been able to stockpiled vast amounts of weapons, equipment and fuel to use in its own pursuits. HYDRA’s arsenals incorporate both Allied and Axis material as well as weapons of advanced design of there own. As of now, HYDRA continues to grow and looks to be a future threat to everyone on the planet. HYDRA Membership: The second reincarnation of HYDRA is made up of mostly elite German and Soviet troops who have seen the futility of fighting for their political leaders and have been secretly recruited into service with promises of wealth and security ofter the war's end. Because its members have been selectively recruited by HYDRA’s high command, its members are mostly made up of brilliant scientists, doctors and battle-hardened veterans from all the world’s militaries. The prospects of great wealth and power has solidified these men’s minds to do whatever it takes to make sure that HYDRA is successful in its missions because what’s good for HYDRA is good for them. Because of their selection, all HYDRA field agents are of Veteran Troop Quality or higher and will always fight with the No Quarter rules because HYDRA takes no prisoners and leaves no witnesses if possible. HYDRA Weapons and Equipment: HYDRA units may be armed with any weapons equipment or explosives from the combined Allied and Axis arsenals as the HYDRA Commander sees fit. HYDRA forces also have access to advanced weapons and equipment of their own design. It is not known where HYDRA has obtained such advanced technology but they have been known to deploy it on the battlefield in limited numbers. These items can range from advanced laser weapons to guided missile systems. To play with such weapons, the HYDRA Commander must write up detailed rules for the weapon, explosive or piece of equipment and then give it to the BM. If the BM agrees that it is within the bounds of reasonable play then it may be issued to the HYDRA force. If a BM is not present then no advance technology is allowed unless already described in other Battleground Weird WWII rules. Any advanced HYDRA technology commandeered on the battlefield will cause the user an additional +2 to their already Captured Use and Unqualified penalties due to its advanced design. HYDRA Artillery: HYDRA doesn't have the resources to field and move heavy artillery and as such is only equipped with mortars within its arsenal. Note that the smallest mortar in use a 50mm and the largest is a 120mm model. HYDRA and Combat Vehicles: HYDRA has only one armored vehicle that it produced itself and that is the Scylla armored car with all other vehicles being that of scavenged or stolen from numerous sources. In fact, HYDRA has developed an incredible supply network that allows them to repair and steal abandoned vehicles on the battlefield very quickly. HYDRA is also very desperate for combat vehicles and will attempt to disable them instead of destroying them if possible. In gaming terms, any HYDRA unit that is within 5” of an enemy vehicle, will charge it and attempt to disable it and then kill it’s crew leaving the vehicle intact so it can be repaired and salvaged. Because of this, all HYDRA agents are equipped with a high number of specialized weapons that help with this task such as smoke grenades, mines and satchel charges. HYDRA also incorporates a special tear gas grenade that can be deployed to smoke out enemy crews so that they can be killed and their vehicle commandeered. These grenades can be thrown just like normal egg grenades and act like smoke grenades when used. Anyone who is in the cloud that doesn’t pass a ¼ Skill Check is considered Broken and is bound by all such rules. Troops with vehicle must pass a ½ Skill check to be immune to it. Troops with gas masks on within a cloud are immune if they pass a successful Skill Check as normal. Another advanced weapon used by HYDRA is the "Can Opener". This lightweight welding torch allows HYDRA agents to cut open crew hatches so that they may engage the enemy within. These devices are about the size of a flare pistol and can only be used twice in a single game. To use one, the operator must be in base-to-base contact with the hatch to be cut and must pass a successful ½ Skill Check to cut it open. If the check is failed then the Can Opener failed to effectively cut the hatch or some other mishap has occurred. Commandeered HYDRA Vehicles: If a enemy vehicle is commandeered, HYDRA agents will immediately mark it so friendly forces will not fire on it. This takes a HYDRA agent two actions outside of the vehicle to do so. In addition, any non-HYDRA units may only fire on commandeered vehicles if they are taking fire from it, saw it commandeered or if they make a successful ½ Skill Check first. This test illustrates their reluctance to fire on a friendly vehicle which may or may not be manned by the enemy. HYDRA Commanders mark any commandeered vehicle with the special BGWWWII HYDRA markers. HYDRA Aircraft: The only aircraft available to HYDRA is a small single-seat fighter jet model and a helicopter of HYDRA's own design. See the Snipe and Condor rules for their special rules. HYDRA Force Size: Although HYDRA has a large membership, it rarely performs combat operations of any substantial size or scope. Most operations are small covert raids or assassinations and usually only comprises of a platoon-sized force. In games of BGWWWII, HYDRA Commanders will have to be given specific mission goals and achieve it with a force no larger then 30 men with no more then 5 vehicles present on the battlefield at any given time. These forces may call in artillery or air support as within normal rules. Shadowy Organization: HYDRA will never team up with forces from other nations for any reason. Also because of its organization, any HYDRA agents captured will never have any information other then basic knowledge of the current operation they were involved with. All HYDRA commanders have cyanide-filled fake teeth which they will use in case of capture to keep their information secret. It is Hydra's ability to keep its organization secret and secure that has allowed it to grow as it has in such a sort period of time. These rules are used when HYDRA forces are used in extended campaigns or when gaming a storyline game. Wargaming Pieces: The Heroclix CMG has some HYDRA minis that are armed with Thompson SMGs that would work perfectly for a WWII-era HYDRA. You could also just paint up your own version of HYDRA with existing nation's uniforms of the time. I use these excellent minis from Victory Force Miniatures as my WWII-era HYDRA.